Do you remember Mikey, the kid who didn’t like anything, except Life cereal? Well, when it comes to menopausal promises, I’m just like Mikey. However, I am going to eat my words this month, words slamming Stratum C and the promise to restore the youthful glow. 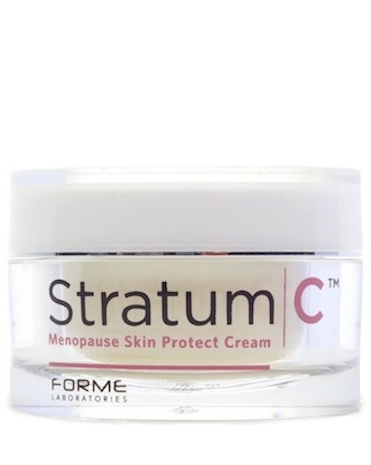 In October, I shared news about Stratum C, a new cream formulated specifically for menopause skin that had been shown to relax facial muscles AND build collagen, while simultaneously moisturizing, promoting elasticity and providing a radiant glow. After I slammed the manufacturers, they offered to send me a sample with the mutual understanding that I would try it for a month but that I made no promises. The verdict? I love the way that Stratum C feels going on and I will state unequivocally that in this subject of one, it did appear to soften my lines and improve my skin’s moisture levels and appearance. Whether or not regular use would yield significant, lasting results is beyond my one month test but I will say that I liked it so much, that I’d be inclined to try it for a longer time period. However, I’m sticking by my guns with regard to Stratum C’s ultimate ability to reverse the ravishes of environment and natural aging. And while I will reiterate that there is absolutely no doubt that one of the peptides contained in this new cream and serum stimulates production of collagen (there are published studies demonstrating that), like a majority of dermatologists will tell you, a skin cream alone won’t turn back the signs of time permanently. Keep in mind that, I only use skin products recommended by my dermatologist (I have rosacea and its accompanying acne issues). But guess what? I’m ready to do some show and tell the next time I visit him. Hey Forme Laboratories! I like it. And as you’ve come to learn, that’s pretty unusual when it comes to products geared toward menopause.